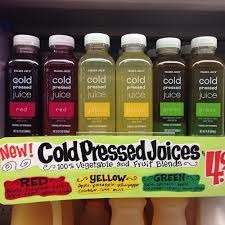 I’m loving the new Cold Pressed Juices from Trader Joes and I wanted to let everyone know about them. They are 4.99 and a great way to add in a fresh juice into your daily diet. They have a red, green and yellow option. In case you don’t feel like juicing yourself, or don’t have a juicer, or don’t want to pay 10.00 (the new going rate for them) you can use these as an alternative. The only downside is that they are not organic. However, I already don’t eat 100% organic all the time. I try to eat organic from the dirty dozen list. So, if you are like me, and buying organic half the time or more, then you can use these! The minute I drink a fresh juice, my eyes open wider, I feel cleaner, crisp, alert, and a desire to eat healthier. I also SWEAR that by consuming more green juice it will naturally lower your sugar cravings! I promise. So don’t even worry if you are eating too much sugar and cant fight it. Just try to add in these juices and see if your cravings naturally decrease. I’m up to at least 2 of these per day and I started to give them to my 7 year old instead of apple juice. They are such a good option on days when he has not eaten enough vegetables. The Red one is so sweet and delicious. The green one tastes clean and I love the yellow too.